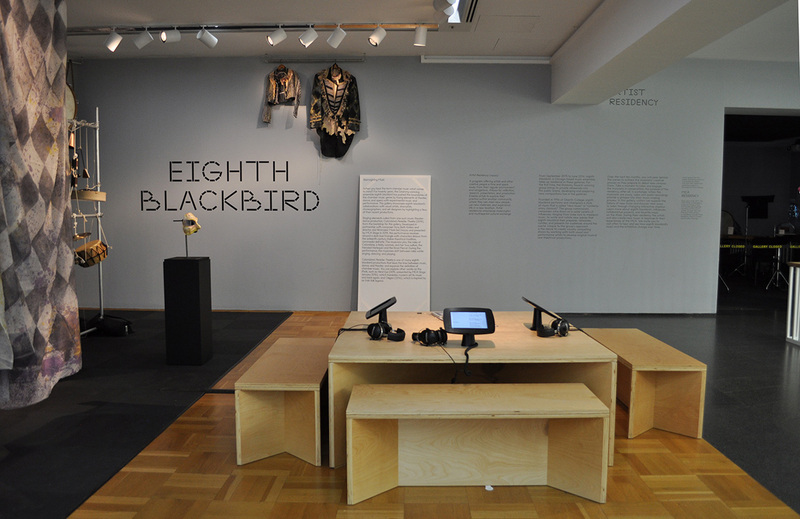 The Museum of Contemporary Art’s 2015–16 Artists in Residence are the Grammy-winning musical group eighth blackbird. The selection of musicians for the museum’s annual residency is a signal of the MCA’s commitment to a cross-disciplinary approach to art and contemporary life. 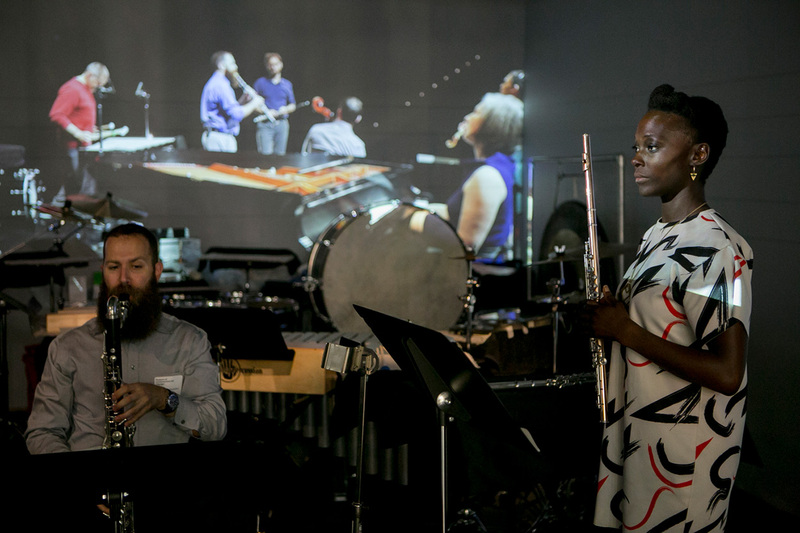 The new music ensemble is spending eight months in the museum’s galleries, composing, rehearsing, and interacting with museum visitors, who are invited to observe and share in the creative process. 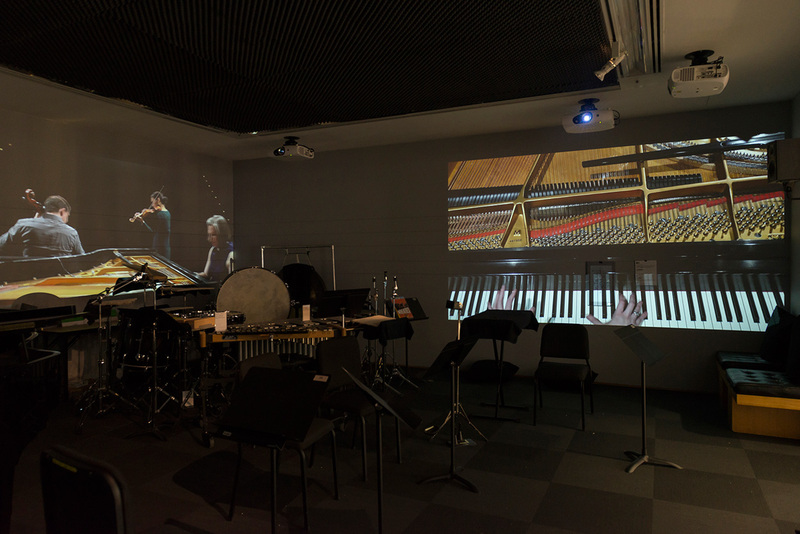 The 1000-square-foot residency space has been divided into two areas: the Studio, which serves as the musicians’ rehearsal space and houses the musicians’ instruments and equipment; and the Salon, which provides visitors with interpretive information—both digital and analog—and hands-on music-making opportunities. Although some or all of the musicians are often present in the Studio space, the group’s busy travel schedule means that the space is frequently unoccupied. To simulate the experience of observing the musicians at work, a 6-channel video of the group rehearsing David Lang’s these broken wings was created by the MCA’s digital media team. 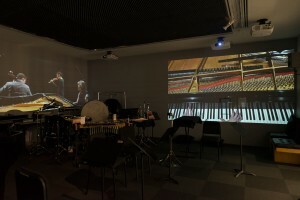 The video is projected onto the walls of the Studio when the musicians are absent, and visitors are invited to enter the Studio for an immersive experience that presents the rehearsal from the point of view of the ensemble members. 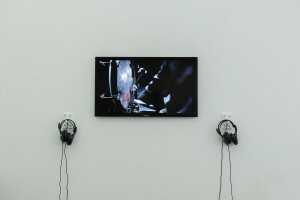 The video’s soundtrack features discussions about the piece, snippets of musical sound, and studio preparations. In the adjacent Salon space, interactive interpretive experiences will change throughout the year. 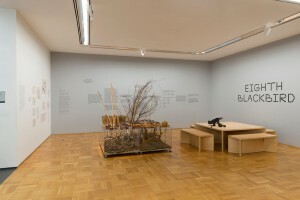 The initial rotation includes a custom-designed installation inspired by John Cage’s Child of Tree, which uses plant materials as percussive instruments. 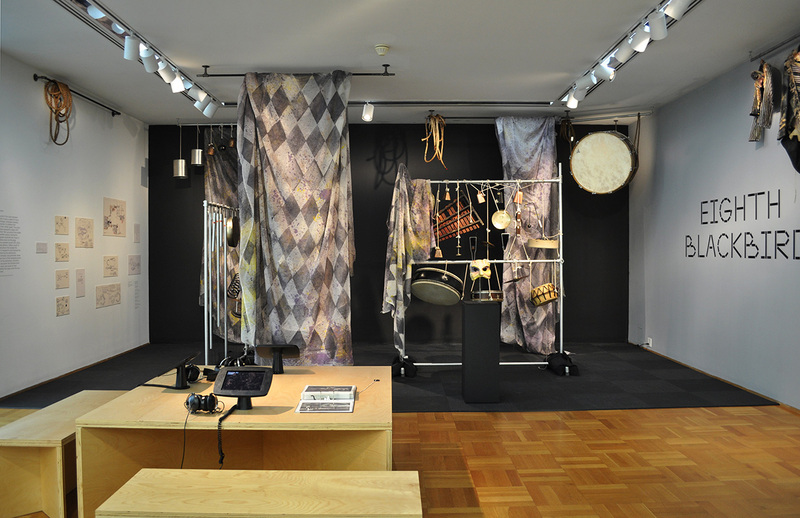 Visitors are encouraged to make sound using the materials, and to consider the questions: “What is music?” and “Who are musicians?” The sound piece is accompanied by an installation of illustrated musical scores provided by the music library at Northwestern University. 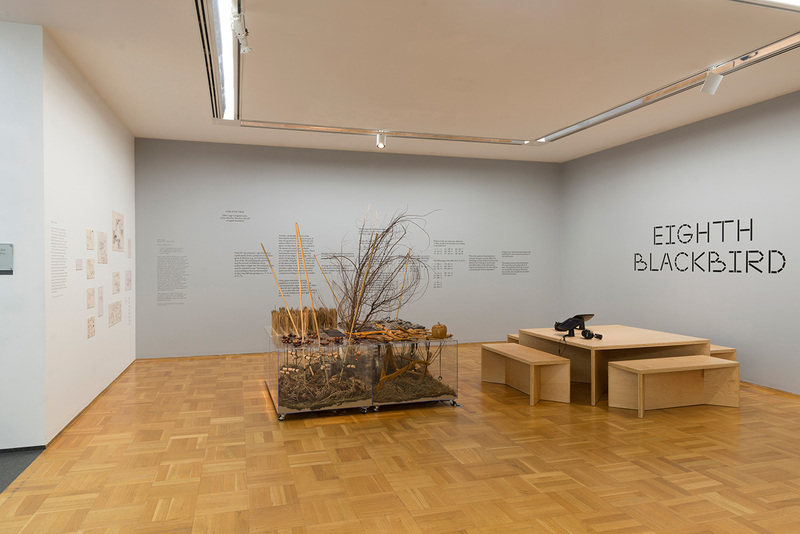 Finally, a large table in the Salon space provides a place for visitors to congregate, relax, and to peruse an iPad-based playlist that focuses on the group’s influences, tastes, and collaborators. 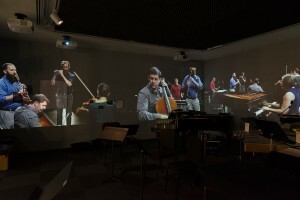 The 6-channel projection in the Studio space was produced in house by the MCA’s digital media team. 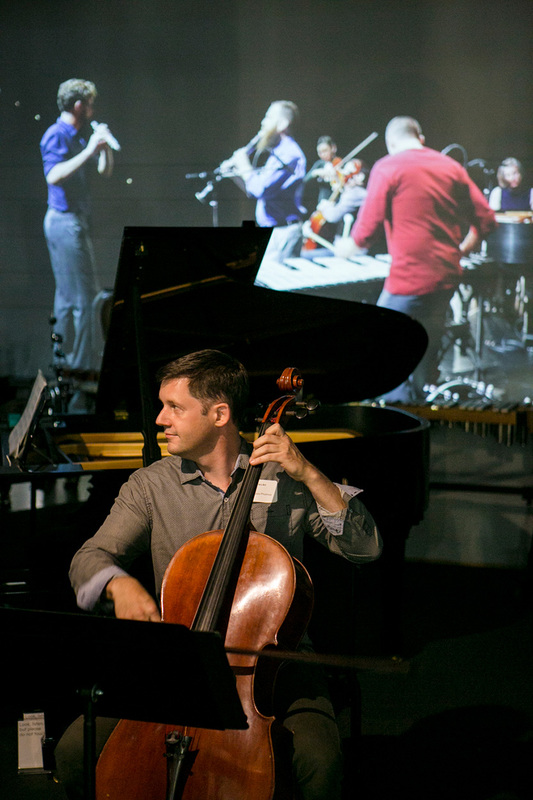 The projected video documents the musicians’ performance of the piece, “learn to fly,” from David Lang’s, these broken wings. The original audiovisual recording involved three cameras, one mounted on a jib, and approximately eight microphones. The projection loops three segments of visual material. 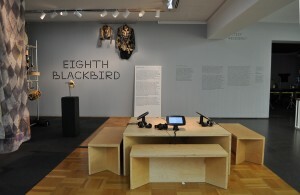 The first two are accompanied by a soundscape of rehearsal ephemera (notes and bits of other pieces) provided by eighth blackbird from several rehearsal recordings. 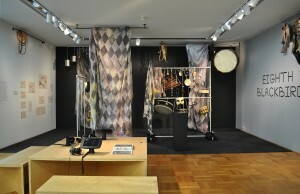 The visual material is more sparse for these segments, making use of black space to highlight certain instruments. The final segment is accompanied by the actual audio of learn to fly and features continuous video from all 6 projectors. Much of the editing is meant to draw attention to the way the musicians communicate nonverbally during a performance, through visual cues and body language.